It’s officially Christmas in Makati! A dazzling lights and sound show at the heart of the country’s business district heralds the beginning of the Christmas season this year, promising Filipinos another unforgettable holiday season. 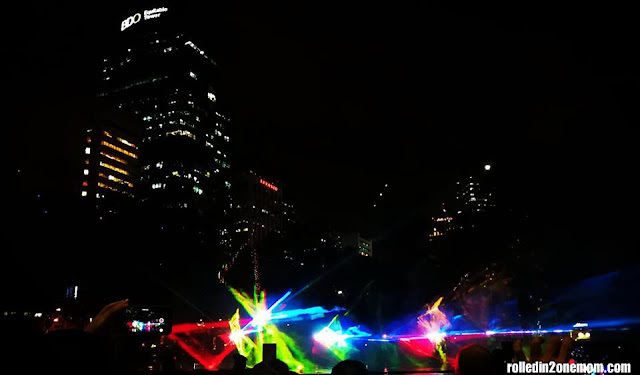 From November 9 until January 7, the Ayala Triangle Gardens will again observe a much-loved and highly anticipated Christmas tradition when it brings the Festival of Lights, its signature lights and sound show, which has captivated thousands of Filipinos for the past eight years. As darkness blankets the city, millions of twinkling lights will come alive across the gardens as the melodious strains of Christmas songs fill the air. In dramatic fashion, the lights begin dancing in sync with the music, creating a captivating magical spectacle. As the lights flash and change colors to the beat of the music, the revelry and joy of Christmas will surely be felt by everyone. The light show is expertly choreographed by award-winning director Voltaire de Jesus and Luther Gumia. More than 1.6 million LED lights were used for the light show, adding brilliance while staying environmentally sustainable. Musical scoring for the three medleys were beautifully arranged by acclaimed musicians and composers. The musical medleys have three distinct themes – Pinoy Fiesta by Roy del Valle, Traditional Christmas by Von de Guzman, and Techno by Tris Sunguitan. One medley will be staged every 30 minutes nightly. Each one boasts of a different mood, pace, and rhythm, while retaining the Christmas cheer that brings people together and envelopes everyone in the spirit of the season. “We want Christmas to be magical for everyone, which is why we have continued with this beautiful Christmas tradition that brings people together and lets them feel the joys of the season,” said Shiella Aguilar, Ayala Land Project Development Head for Makati. This year’s lights and sound show is presented by Ayala Land, in partnership with MasterCard, HSBC and SunLife Financial. Makati’s Filipino Christmas wonderland extends beyond the Ayala Triangle Gardens. Across the city, major Makati thoroughfares Ayala Avenue, Paseo de Roxas, and Makati Avenue are decked in over a million Christmas lights done in the patterns of native woven fabrics such as Inabel and Burdado of Luzon, Banig Tikog of Visayas and T’Boli, Ukil and Yakan of Mindanao. Gigantic Christmas ornaments lit up in the same native patterns can be found on concrete islands, bringing the holiday cheer even closer to people who roam the city’s streets. There will also be several activities at Circuit Makati such as the Christmas Tree lighting ceremony on November 17 and the Pop-Up Town Bazaar on November 17-19. For added holiday cheer, Ayala Land is also bringing the lights and sound show to its various estates across the country. It will be held at Vertis North, Nuvali, Bonifacio Global City, Centrio, and Ayala Center Cebu—spreading the sights and sounds of Christmas to more people. The majestic Festival of Lights has made it to the coveted list of Conde Nast Traveler’s Most Spectacular Lights in the World, in the company of distinguished luminaries such as the Tivoli Gardens in Copenhagen, Denmark, the holiday lights display at the legendary Champs-Elysees in Paris and Japan’s Kobe Luminarie. Indeed, Christmas is the happiest time of the year, and Ayala Land promises to deliver a memorable and unforgettable Christmas celebration to thousands of Filipinos from all walks of life with its signature tradition. Bring magic to your Christmas celebration with the Festival of Lights at the Ayala Triangle Gardens! The show will run daily until the 7th of January 2018, every half hour from 6PM to 10PM.